For a month, day after day, consider carefully the precious words 'Abide in me.' Step by step we will see how truly this promise-precept is meant for us, how surely grace is provided to enable us to obey it, how indispensable the experience of its blessing is to a healthy Christian life, and how awesome are the blessings that flow from it. Andrew Murray invites you to listen to words from Scripture, read a daily meditation, pray, and surrender yourself anew to Christ. This thirty-one-day devotional is as timely now as it was in 1895 when it was first published. Newly updated and edited for today's readers, Abiding in Christ brings a fresh understanding of what a privilege and high calling it is to abide in Christ. 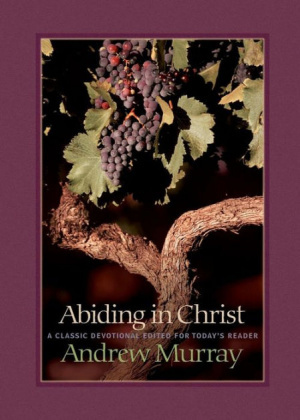 Abiding In Christ by Andrew Murray was published by Bethany House in January 2003 and is our 23946th best seller. The ISBN for Abiding In Christ is 9780764227622. Be the first to review Abiding In Christ! Got a question? No problem! Just click here to ask us about Abiding In Christ.